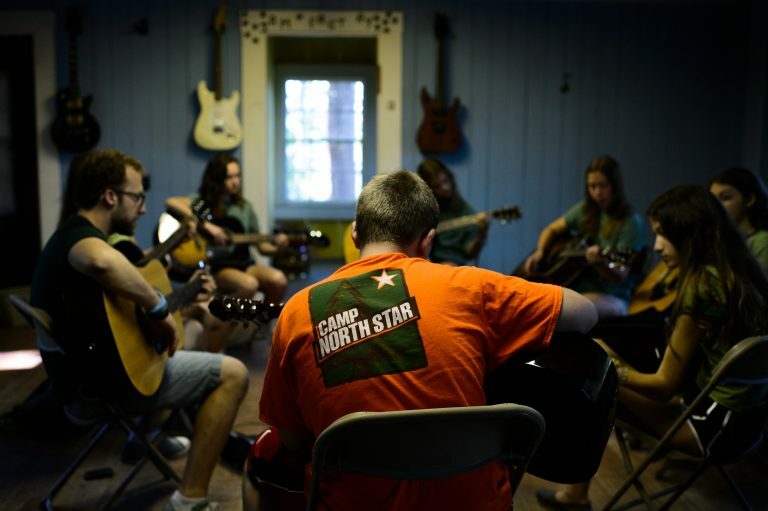 Music and performing arts are an important part of the fabric of Camp North Star in Poland, Maine. From singing in the dining hall, to preparing for the camp musical, to learning how to play the guitar, to performing in your cabin’s Lip Sync Contest performance, there are numerous opportunities for campers to gain an appreciation of music. Camp North Star’s elective program allows campers with an interest in music and performing arts to choose from an array of activities that includes dance, music, theater and signing. These classes are tools that can be used for campers to express themselves in a way that written or spoken word doesn’t allow them to do. Dance classes give campers an artistic outlet to do what they love, and can create a strong sense of self-confidence. Music classes present campers with a chance to explore music as a way of self-expression, and has provides numerous benefits for the growing minds of youth. • Stress Relief – playing music brings your energy and focus into a positive activity, which can help alleviate stress. Those reduced stress levels can help get your blood pressure and heart rate down to a healthy level. • Exercise – Playing an instrument naturally leads to increased physical activity. Whether you’re playing the piano, guitar, strings, or a wind instrument, you’re using your arm and back muscles to play and/or hold up your instrument. And if you play the drums, you even get to do some cardio. • Self-Expression – Whether you’re writing your own piece of music or playing someone else’s, music allows you to express yourself in new ways. You also get to be creative when choosing your own unique style and genre. • Making friends – Whether you use music as an icebreaker when meeting new people, or as a way to actually meet new people – playing in a choir, band, or dance company – music is a great way to make new friends. At Camp North Star, another benefit of music and performing arts is that it’s also a great vehicle to help create memorable moments. Because music plays such an important part of the North Star experience, it is at the centerpiece of some of our most popular evening activities and special events. Campfires are all about signing and skits. Sign Out is the culmination of several days of practicing your song with several cabins. Dances at the end of each session are always fun evenings with your friends. These are all memories that stay with us long after the camp season has ended.